This dish features a selection of our native seafood which literally hangs out on the coastal cliffs here in Pantelleria. 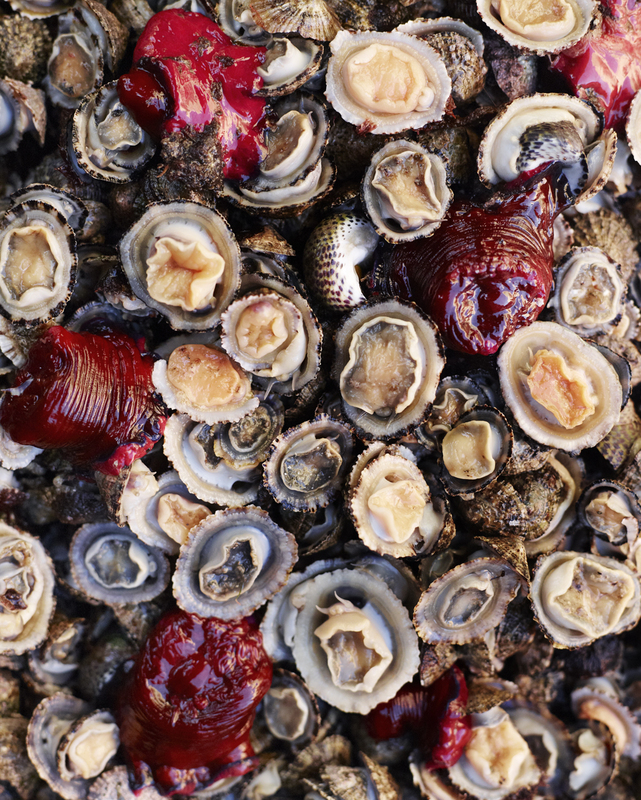 What you see in the photo below is a little mollusk called Patelle in the local dialect. Limpet in English, it lives on the rocks by the sea. As the tide shifts, it’s easy to pluck them from the rocks. The other shell, is a sea snail called Babbaluci in Sicilian and the bright red anemones (Beadlet) are Pomodori di Mare. 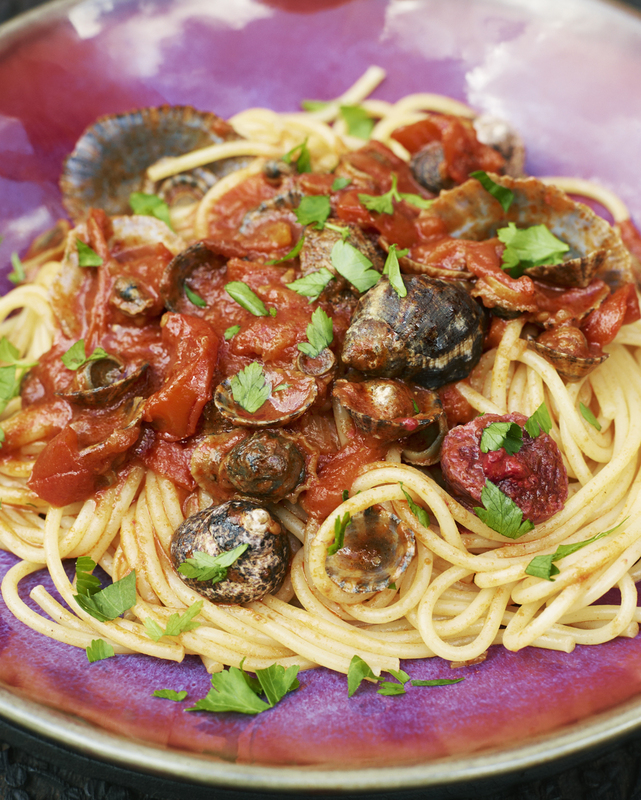 Together these create a flavorful Frutti di mare pasta sauce. It’s important to cook with the shells attached as they add to create a beautiful broth of the sea flavoring the sauce. Enjoy this pasta with a glass of dry white wine. Wish you all a great week. Place medium sized pot filled with water one teaspoon of sea salt and lid on top onto the large burner turn on the heat and bring to a rolling boil. Place your large saute pan over medium heat add olive oil. Add the garlic into a pan have a wooden spoon handy and stir the garlic it will turn to a light white color, add the dried chili flakes, stir again, add the seafood and the wine. Let simmer together so as to allow the shells and the seafood to lend their essence to the sauce. Add the tomato sauce, salt and pepper to taste. When the pot of water for the pasta is boiling cook the spaghetti according to the instructions on package. When the pasta is cooked to the texture you desire, strain from the water using a colander. Add pasta to the sauce and mix. Portion the pasta onto plats, sprinkle the parsley over the top for garnish. This entry was posted in Pasta Recipes and tagged Anna Huerta, Babbaluci, Frutti di Mare, Pantelleria, Pasta, Patelle, Pomodoro di mare, Sicily, Spaghetti frutti di mare on April 28, 2013 by Anna Huerta.